Every December after the fresh-cut tree is up I set aside an evening to gather around and unpack our family ornaments. We take turns hanging them one at a time, sharing again the familiar story behind each one. A trio of brilliantly painted wooden angels always delights. Like a little chorus of seraphim in heaven, they sing out their song, “holy, holy, holy!” I wanted to share my family’s tradition with you by designing a simple crochet angel ornament pattern with just enough charming detail to earn a place on your family’s tree for years to come. 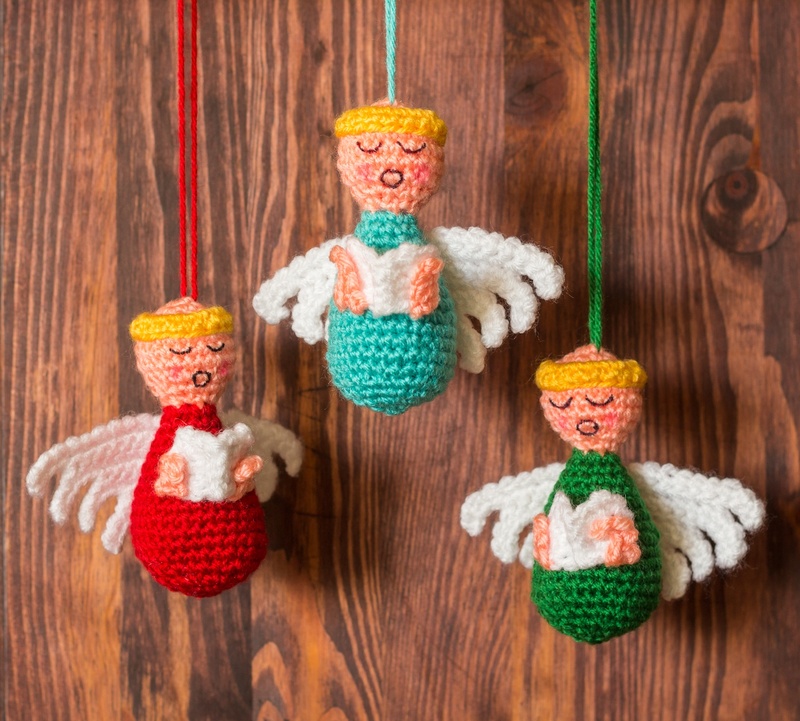 Make your angel with any yarn and the proper hook. I like a durable sport weight yarn in bright colors. For tidy looking stitches, consider going down a size from the recommended hook. The suggested materials make an angel about 4 inches tall. Gauge is not too important for this project: you’ll just get a bigger or smaller ornament. Choose your favorite technique for the face and music. I used a fine-tip felt pen and a red pencil for the cheeks. You can embroider features, sew on beads, or glue on felt cutouts. To hang, simply thread a scrap of yarn through the head. If you signed up for my newsletter you already received your exclusive discount on this pattern. If not, be sure to sign up here because I have more fun patterns in store for your crafty side! Very cute little ornaments. Nice of you to share. We used to take turns with the decorating also, was fun; but now with DD not at home and hubby who only likes to put a few on, it’s pretty much a solo job for me. Out blog walking and found myself here. So glad you stumbled on my blog, Sandy! It’s funny that you do it alone now, with the kid grown, since it’s opposite in my family: once we were grown, my mom would plant herself on the couch and boss my sister and I around while we did all the decorating. As long as we’re all together, right! ?